I’ve mentioned it on the show a couple of times, and now it’s finally here! The Kult: Divinity Lost Kickstarter is live! We discussed Kult back in Episode 31 of the show. This is the long-awaited 4th edition that is using a variation of the Apocalypse World game mechanics, rather than the clunky, sanity-shattering rules of previous editions. The Kickstarter had a 95,000 Swedish Krona goal to be fully funded (Approx $11,178 / €11,133 / £8,015 at the current exchange rate). It hit that goal in 12 minutes. It seems to be a trend with RPGs making a come-back, as the highly successful 7th Sea Section Edition Kickstarter has shown. That funded in 7 minutes, and has gone on to be the most-funded RPG project on the site to date (standing at $716,652 at the time of writing this, with 17 days left to run). The Kult: Divinity Lost Kickstarter runs to 31st March 2016, and they are already ploughing through stretch goals! The book comes in a number of different editions, all full-colour, all available at different reward tiers, and in some cases as add-ons. The Illusion Edition is the standard version of the book that will be available for normal retail. This features an angel, bound in chains, and is a nice homage to the first edition cover. You can get this as a pledge level, or as an add-on. The Enlightened Edition is like the standard copy, but has uncensored artwork (i.e. the angel is naked). While it will not be available in game stores, it will be available to purchase online once the game is released. You can get this as a pledge level, or as an add-on. The Elysium Special Edition has a white cover with red logo, and the Inferno symbol in the background. It will not be available in game stores, it will be available to purchase online once the game is released. You can get this as a pledge level, or as an add-on. One of the stretch goals that has already funded is the Bible Edition. This contains no artwork and is presented like a regular Bible. Reminds me a little of the Explorer Editions for Savage Worlds, just with more style! This is currently only an add-on item. Then we get to my favourite section, the Limited Editions. The project creators stated that they wanted to make this a deluxe experience from the start, and they meant it. The Metropolis and Inferno Collectors Editions are limited to 250 copies each. Metropolis is a black blue faux-leather cover with the Metropolis symbol highlighted in gold. Inferno is a brown red faux-leather cover with the Inferno symbol highlighted in gold. These are pledge-level only, not available as add-ons. The Archons and Angels of Death Collectors Editions are limited to 20 copies (i.e. the 10 individual Archons, and the 10 individual Angels of Death). Like the Metropolis/Inferno Editions, Archons are black blue faux-leather and Angels of Death are brown red faux-leather. 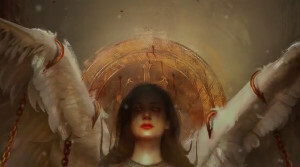 Each features the relevant faction symbol in the background, and then a gold-highlighted symbol unique for each Archon/Angel of Death above that, and the relevant name towards the bottom of the front cover. This means each one is unique. These are pledge-level only, not available as add-ons. You do get an Elysium Special Edition added in though for regular day to day use. The big two are the Astaroth and Demiurge Editions, limited to 1 each. These will be unique. These are real leather covers, with choices of leather to be selected by those that pledge for them. All they have said so far is that they will have unique covers relating to Astaroth/the Demiurge. No image of mock-ups have been released yet – just a big question mark. You get two copies of the Elysium Special Edition added in though for regular day to day use. Ahead of the Unknown Armies Kickstarter that is due to start sometime in March, I’ve earned some charges for the Bibliomancer in me by being Backer #1 and grabbing the Demiurge Edition, but the Astaroth Edition is still available at the time of writing this. I’m really looking forward to seeing all the stretch goals they meet on this one. They’ve already got the Bible Edition, extra archetypes, and the Narrators screen. Just waiting for them to post more up now! I’ll be back, no doubt when the Unknown Armies Kickstarter goes live. Until then, keep watching as the Illusion falls apart around us all! The Demiurge Edition, seriously? I’m stunned. It looks beautiful. I am getting flashbacks to the 90s superhero comics with all their variant covers. Wow! The huge cost of the Demiurge and Astaroth editions includes the development of a specfic and unique scenario, that Matt Sandorson will now help develop(!). I wonder if it will only be available in that specific tome. Would be cool if that is the case. Ahhhhh, that will be my poor monitor not being so good on colour… Or maybe my eyes. One of the two! Yep, I’m thinking about what I would like the scenario to be about currently. Tempted by something around the Dream Princes or Vortex, as not much as been written about them yet that I can recall.